The last single to be issued by The Wurzels in the 1980s, this was issued on the small Far End label, manufactured and distributed by Spartan Records. Little is known about the record, but it is believed to have been produced as a promotional item for the Weston-Super-Mare tourist board (or whatever their official title was at the time). 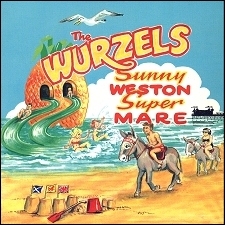 The single came in a picture sleeve (see above) with a cartoon showing a typical seaside scene with donkeys on the beach, sandcastles, the pier, and people on water slides coming out of what looks like a giant pineapple (on second thoughts, perhaps it's not that typical after all). Printed on the reverse of the sleeve are the lyrics to the song, which is a catchy ditty in praise of the famous seaside resort. The B side of the single is an instrumental version which sounds like the backing track of the A side, giving the record owner the chance to sing along in their own karaoke version using the supplied lyrics.